An animal welfare charity is appealing for information after a sparrowhawk was found cable-tied to a bottle in Angus. The bird was discovered by a member of the public in a field at the top of Lochend Road in Carnoustie on Sunday. The Scottish SPCA freed the sparrowhawk after ensuring it was uninjured. Animal rescue officer Dionne Boyack believes it is possible it ended up stuck by accident, but has appealed for information from anyone who knows that was not the case. She said: "We were notified by a concerned member of the public who came across the sparrowhawk. 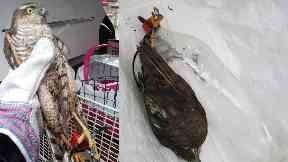 "It was found to be tethered in an unusual way, so we don't suspect this to be a falconer. "It is possible the bird got caught up in this unfortunate way by accident. "After assessing the sparrowhawk for injury and being satisfied that he had none, I freed him and he flew away." If you have any information as to how the bird came to be trapped in this way, call the Scottish SPCA's confidential animal helpline on 03000 999 999.